Neil and I are big fans of lamb burgers. New Zealand lamb is readily available in most supermarkets, certainly more expensive than ground beef, but New Zealand lamb is 100% grass-fed and to me so much more delicious than most hamburger meat, so worth the extra cost (usually $8-9 a pound). However, if all you have at home is ground beef it will work just fine in this recipe. One night this week I wanted to make something quick and flavorful. I knew Neil would be happy with burgers, but I just needed something else. Chili is always a good idea, I like mine spicy with a subtle sweetness. Usually I do this by adding black strap molasses and cayenne pepper. 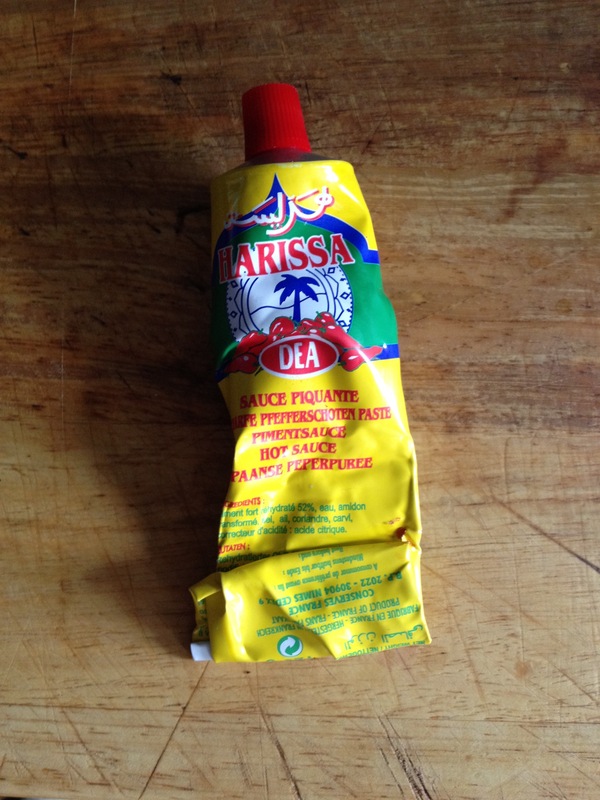 While rustling through my fridge I remembered I had a tube of Harissa, which got me thinking. 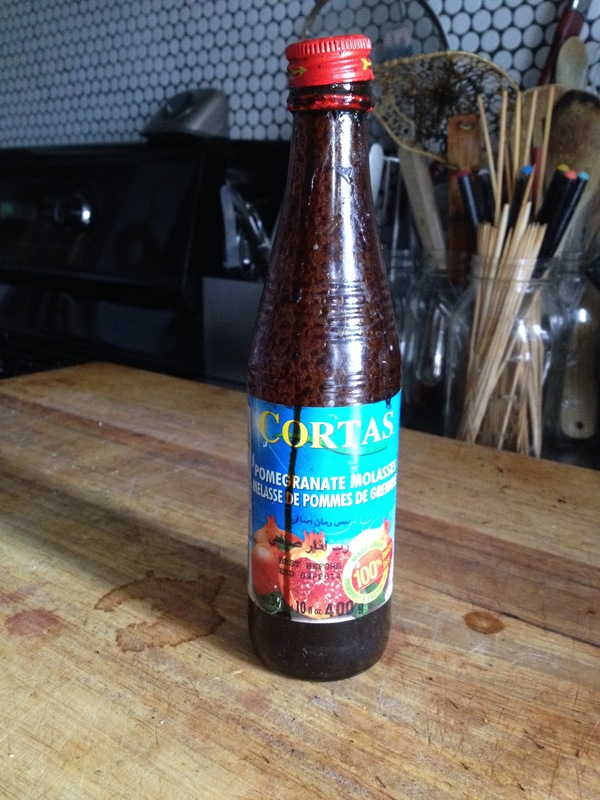 Then I discovered I didn’t have any black strap molasses, I did however have pomegranate molasses, an idea was forming. It manifest into one of the best chili recipes I’ve ever made. The following day (when it had gotten even better) Neil said he liked it, but it was a bit spicy for him and he’d love it with some pasta in it. He just meant any random boxed pasta, but it got me to thinking about gnocchi. For two reasons: the last gnocchi recipe I made was a total disaster so I was determined to find one that worked and was easy. The second reason is: I love gnocchi. If you choose to just make the chili it can be served any number of ways, as Sloppy Joe’s over a toasted hamburger bun, with corn bread or tossed with your favorite pasta. In a large deep pan add: 1/3 cup of olive oil over medium high heat. When the oil is hot add: 2 1/2 pounds of ground lamb, season salt and pepper and cook until browned. With a slotted spoon remove lamb to a bowl. In the hot oil and juices left in the pan add 2 large thinly sliced onions. Cook until wilted and just starting to become golden, about 10 minutes. Stir in 8 cloves of garlic, smashed and roughed chopped, cook for a minute then add 1 tablespoon of Cumin Seeds, cook for 2 minutes. Stir in 1 tablespoon of cumin powder, 2 tablespoons of chili powder, 2 tablespoons of tomato paste and 1 tablespoon of harissa (I use the kind from a tube, if you are concerned about the level of spiciness start with 2 teaspoons and adjust seasoning at the end if you want it hotter). Reduce heat to medium and cook for 5 minutes stirring often. Add 1 28 ounce can of tomatoes (juice and all). Reduce heat to a simmer and let cook for 30 minutes. Add 1 15 ounce can of Pinto beans and 1 15 ounce can of Black beans (or fresh cooked beans if you have them, the join of this dish is that is can be made from items already in your larger. You can use all of one kind or a different kind of together like kidney or even chick peas). Cook for another 5 minutes then stir in 2 tablespoons of pomegranate molasses. Add salt and freshly ground black pepper, taste and adjust seasoning. Just before serving stir in 1 cup of roughly chopped Cilantro or Parsley. I added half of each because that was what I had in the fridge. It’s all good. I wanted to add this recipe because it seems somehow not an obvious choice to go with this chili. You may decide you want to toss it with Pesto or slow cook it in some home-made Marinara sauce. 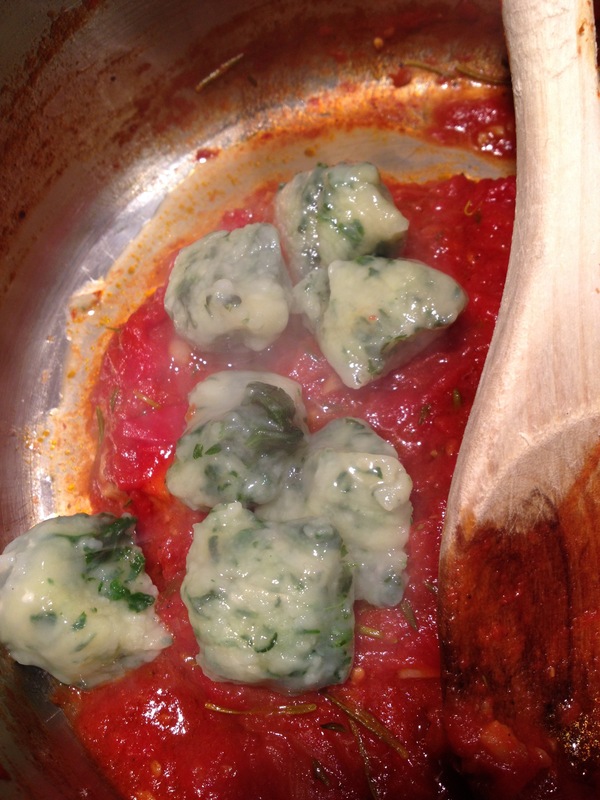 Whatever you decide you will want to keep this recipe as it is by far the easiest gnocchi I’ve ever made. The most trusted Anna del Conte (the gnocchi recipes on one of hers) confirms that the important difference between Piedmontese gnocchi and those of the Veneto is that the former should not contain eggs. Fro some reason I thought eggs would enhance flavor, make a lighter gnocchi and work as a binder, in reality I find just the opposite. Most recipes for gnocchi called for russet potatoes, I used Yukon Gold because they were what I had on hand, it wasn’t the end of the world. Place 1 1/4 pounds (about 2 large potatoes) of whole potatoes with skin into a medium size pot, cover with cold water and add a large pinch of salt and over medium high heat cook until a skewer pierces them easily. While they are cooking, add 1 Tablespoon of salt and 1/4 cup of water into a large sauce pan, over medium-high heat until the salt has melted. Add 1/2 pound of spinach and cook until the leaves are completely wilted, remove from the heat and strain in a fine sieve. When cooked enough to handle squeeze any excess water out and purée in a small food processor or finely chop by hand. Remove the cooked potatoes from the pot and let cool until you can handle them, remove the skins. Place in a ricer and over a work surface (marble or stone is best) generously sprinkled with flour, rice the potatoes. Sprinkle with 2 Teaspoons of salt, make a well in the center of the potatoes and add the puréed spinach. Sprinkle with 1/2 cup of all-purpose flour knead the mixture with your hands until it comes together. Adding more flour if needed until a smooth dough forms. A pastry scraper is very handy here. Don’t over work or they will become tough. Cut the dough into 8 pieces and roll each one out into 12″ ropes on a floured service. 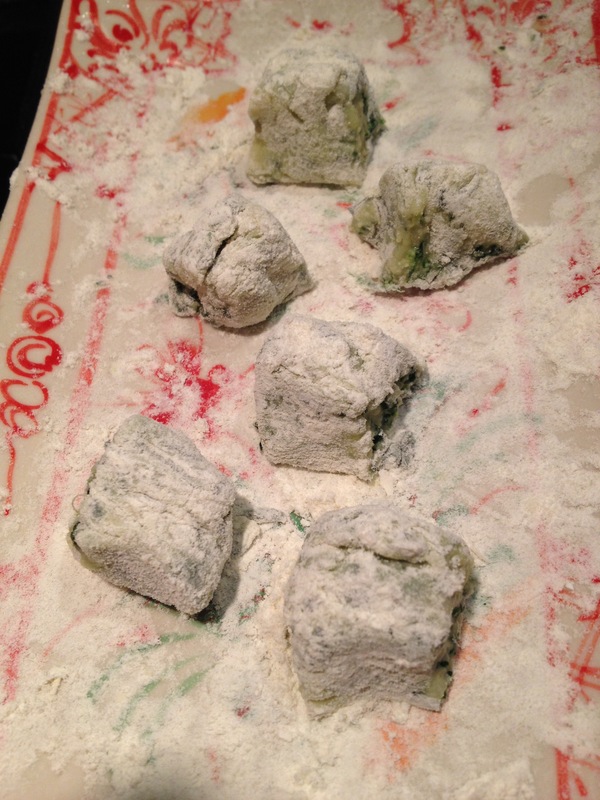 Cut each rope into 1″ gnocchi. Place the finished gnocchi on a floured cooking sheet or plate. When ready to cook, fill a large pot with cold water, salt generously and bring to a slow rolling boil. 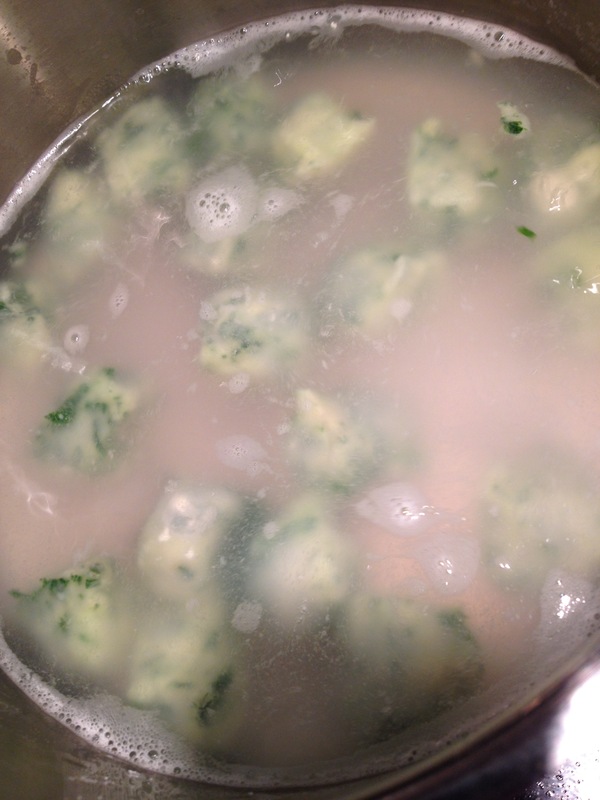 Gently place the gnocchi in the water and cook until the gnocchi float to the service. Stir if you notice them sticking together. Remove with a slotted spoon into a bowl. There were left overs so the next night we had them with tomato sauce. 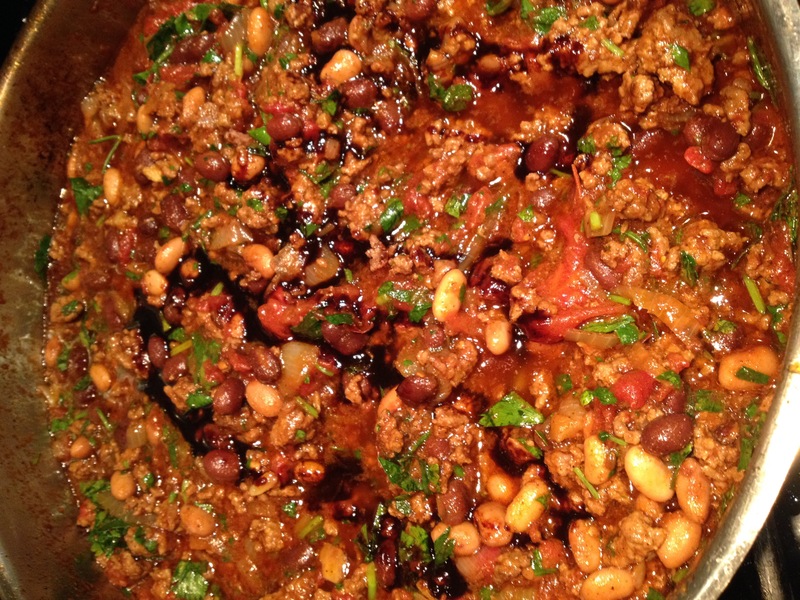 This entry was posted in Recipes and tagged black beans, Harissa Lamb Chili, Harissa Lamb Chili with Pomegranate Molasses and Spinach Gnocchi, lamb, Lamb Chili, Pinto Beans, spinach. Bookmark the permalink. You are the ultimate Type A, inventing a smashingly excellent take on chili wasn’t enough. 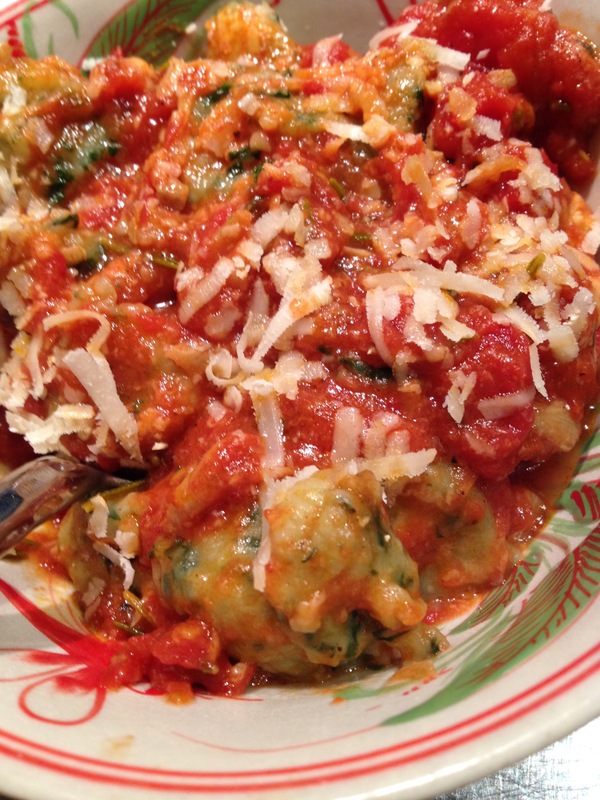 Then you dig into spinach gnocchi! Two fantastic ideas. Two great recipes!!! That’s so funny all I could think of when I was cooking/writing was how long it’s been since I posted a recipe!